Need Glass Display Cabinets For Your Next Exhibition? The doors, as you can see in the image are at the opposite side to the lights, on the glass display cabinet. 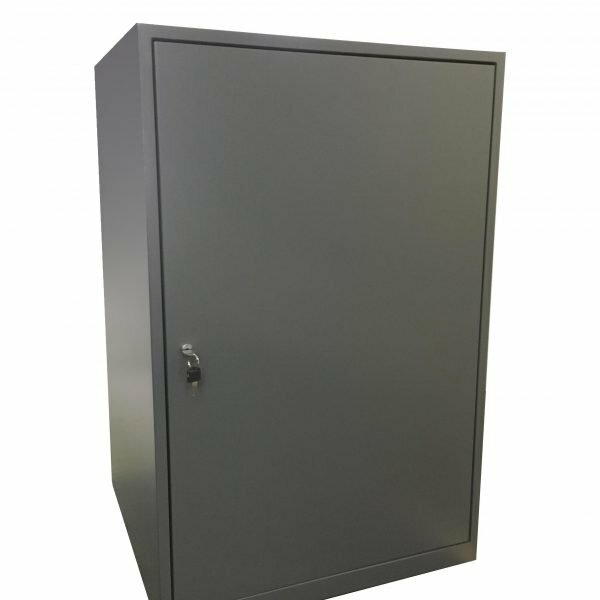 If you are having internal storage on your plinth as a customisable option, the door to the plinth will also be lockable. The keys for your order will be keyed alike so the same keys will fit the cabinets, however they will be individually keyed as a group. This means that if other companies or individuals have puchased our cabinets your keys will not be the same as theirs. Smooth and incredibly small stainless steel swing hinges are just 20mm in diameter ensure that the cabinet retains it’s contemporary look. See an image of the cabinet from the back to see the lock and the hinges on the cabinet itself. The lighting that we provide as standard are polished chrome stalk lighting with LED bulbs. We have a range of light spectrum bulbs available depending on the item(s) you are displaying in the cabinets and how to best enhance them for customer viewing. Our regular bulbs are 3000K which best enhances gold jewellery. We have high power LED bulbs with a cooler light at 6000K which is best for silver and diamond jewellery. If you would like a cabinet which you can place in the middle of a room without wires for lighting then battery powered lighting is the best option for you. We can provide chargers for the batteries if you purchase the battery powered system, or extra long life batteries if you need more than 49 hours. What Customising Options Are Available? As our cabinets are hand-made in our workshops in Somerset, we have a wide range of customisable options available to us and therefore our customers. 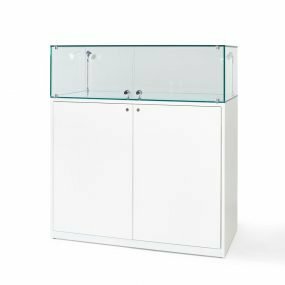 If you have specific requests about the functionality you would like from your glass display case and display plinth, we would be delighted to help you with your request. external and internal sizes of the cabinets, including the material specifications. Can I Purchase A Different Size? Currently our standard range are the glass display cabinets mentioned on this page. 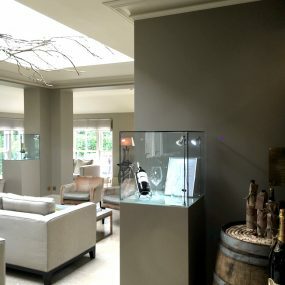 If you would like a specific size we would be more than happy to assist you by filling in our bespoke custom display form which we can make any shape or size glass display case for customer purchase. Our lead times are 4 weeks for bespoke creations in which you can request whatever size or shape cabinets you need. Who has purchased from you previously? The glass display cases and plinths will be delivered to your location on a Thursday between 12 noon and 5pm. We can guarantee that our team will be at your delivery destination by 9am. Your display cases can be collected between 5pm and 8pm by our evening team. We offer a weekend and out of hours courier service for your event if storage space is not available.